Our client’s businesses encompass a broad range of financial services asset management, banking and consumer finance, credit and charge cards, insurance, investments, investment banking and trading and use diverse channels to make hem available to consumer and corporate customers around the world. Our client is largely organized into five groups. DOGS (Decentralization Operations Global Support) is one of the business critical application for above-mentioned group. DOGS is the clearance, settlement and reconciliation system of The client; which receives trading information from different client systems, interacts with 10 legal entities for various trading activities, and feeds data into different systems. The system was developed in early 90’s with around 2.5 million lines of code (LOC). About 1500 users spread across the globe use DOGS and constitutes multi-development team from 3 major hubs UK, USA & Japan. DOGS Application is currently in production on Solaris 2.5.1. Sun Microsystems is to phase out support for Solaris 2.5.1 & hence, the client has decided to migrate DOGS to Solaris 2.8. Along with this migration, major aim of the project was to split DOGS application into a number of well defined, (about 125 ) atomic packages. DOGS Application is required to be made ANSI compliant, UDEEG compliant & Security compliant. It required adherence to standard directory structure, XENV usage, HERMES for deployment, Password Encryptions etc. Many of the DOGS technology components were required to be upgraded as part of this initiative. Eg: Sybase from 11.0.3 to 12.5, Perl from 5.0.2 to 5.8, SQR from 4.3 to 6.2. One major enhancement was to upgrade TAP processes to use new thread-safe TAP architecture which uses RV based libraries, File based auditing to Database Auditing, EDI based framework for Publishers/ Consumers & Recovery servers. Xoriant team implemented to well-defined migration methodology that helped successful completion of project. Migration methodology was meticulously planned to address integration as well as component level issues, that could arise in such a conglomeration of various technologies. Every individual technology corresponded to migration guideline document, which took care of OS level dependencies, keyword usage, deprecated functionalities as well as any new features added. Above all the technology migration, there also was a sophisticated approach towards packaging tasks and release management for adherence to The client standards. The team comprised of dedicated group of people to responsibly execute individual stages of the whole process. Every delivery (internal or external) stage involved a succeeding testing stage to ensure better throughput with expected quality and schedule. DOGS is a conglomeration of technologies on Unix platform like C/C++, Sybase database, integrated with several other SQR, JAM, TIBCO CI Server, MQ Series, RogueWave, AutoSys, Shell Scripts, Perl applications. The first challenge was formation of good project team with relevant skills in these technologies. Large offshore team was planned to work remotely on VPN. Infrastructure challenge to support such large team & provide good performance during development was key factor. Project management was identified as critical success factor to meet the aggressive delivery timelines. The challenges were detailed task planning for optimum resource utilization, communication between onsite/offshore team & risk management considering the project complexity. One more important challenge was to minimize the learning curve on domain of DOGS application, on The client standards & new Technology architecture like TAP. Xoriant team with its technical & process competence worked out many value- adds during the project execution cycle. Xoriant in Mumbai setup a team with a combined strength of individual technological expertise as well as considerable experience of working on Unix development and deployment environment. Xoriant was responsible for entire migration & unit testing of DOGS application. The client was responsible to provide all relevant inputs for migration / unit testing. The client was also responsible for regression testing & production promotions. It also fully utilized its existing stable and secure infrastructure to establish VPN connectivity to the client servers, as all the project development & testing was done directly on the client’s network. Xoriant also deployed on-site resource to act as a bridge between the client and the offshore development team, to facilitate the execution of tasks as well as take advantage of time zone difference. Xoriant used their management expertise during regular customer project reviews to resolve issues & mitigate any risks. Close interaction with customer with appropriate escalation mechanism has helped to ensure that project progressed on schedule. Xoriant implemented CMM level 4 processes during the entire project execution cycle, which included regular project audits to ensure compliance. This included following checklist for migration as well as testing. 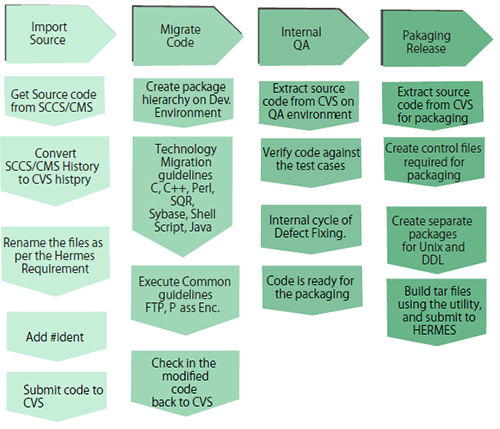 Every package submitted to Hermes was checked against these checklists to ensure quality standard compliance. Knowledge sharing sessions were conducted to ensure smooth execution of migration tasks, avoiding personnel dependencies on most of the tasks. Dedicated resource was assigned for tasks of configuration management, Packaging, Release Management and Defect Analysis and Reporting. Peer reviews, test case analysis, and scope definition, was done on regular basis to accommodate updates in the project task-lists. 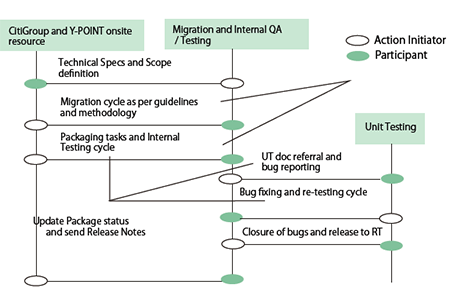 SQA team was responsible to provide helpful inputs for improving the testing and bug-fixing cycle, by documenting the complete migration as well as testing process, with all the related parameters. By submitting your information to Xoriant, you agree to our privacy and cookie policies.